Rustington beat Bosham 7-0 to progress in the Sussex Intermediate Cup on Saturday and the performance left boss Kerry Hardwell delighted. A hat-trick from Steve Kirkham and goals from Jose Irish, Chris Darwin, Jack Anderton and Owen Miles saw Hardwell's men cruise to victory. Hardwell said: "It was a dominant performance from the boys yesterday, we controlled the game from the first minute until the last. "It was probably the best footballing performance so far this season. "Three first half goals from Chris Darwin, Josh Irish and Steve Kirkham made my half team talk very easy and the second half was all about keeping up the hard work. "Two more goals in the second half from Kirkham wrapped up his hat-trick and goals from Jack Anderton and a first senior goal for 16 year old Owen miles secured us through to the next round of the Intermediate Cup." 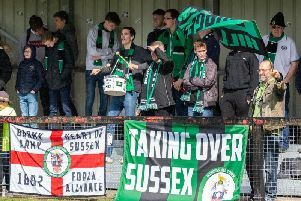 Hardwell added: "Respect to Bosham and their young side who didn’t stop battling throughout." Next up for Rustington is an away trip to Worthing Town in the league. Rustington: Billy Nash, Jack Anderton, Richard John, Mike Gilchrist, Oli Chick, Dec Jenkins, Ryan Hudson, Rob Brown, Chris Darwin, Josh Irish, Steve Kirkham. Subs: Aaron Meehan, Owen Miles, Carl Bennett, Jack Lleylwn, Pete Hurst.